SteamPunk Glass: Snakes, Gin bottles, and a busy week! Snakes, Gin bottles, and a busy week! 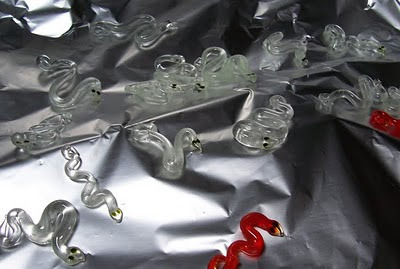 New snakes with the eyes painted on, waiting for them to dry. The bright orange ones are a lovely soft glass called 'Clockwork' that I couldn't resist making some non-glow ones in too. Well it's hardly been a quiet week, amongst everything else I need to do I've been filling up the kiln to bursting point! 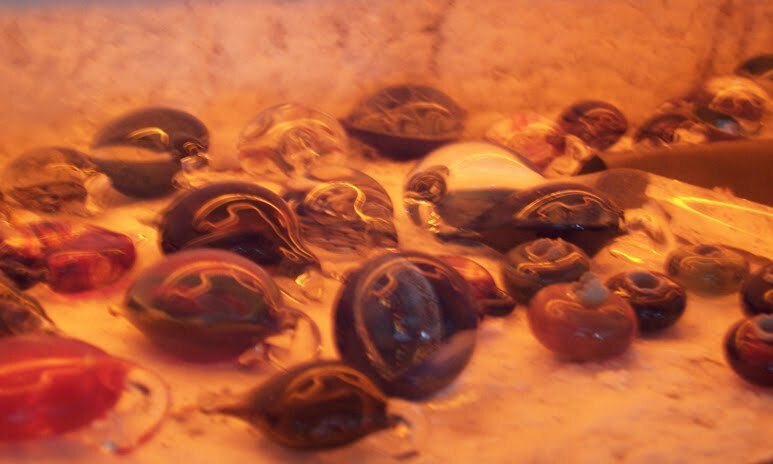 I got a quick photo of some of the latest batch, excuse the wobbly photo as I had to peak through the kiln door to get this shot and I don't think the auto focus liked it much! 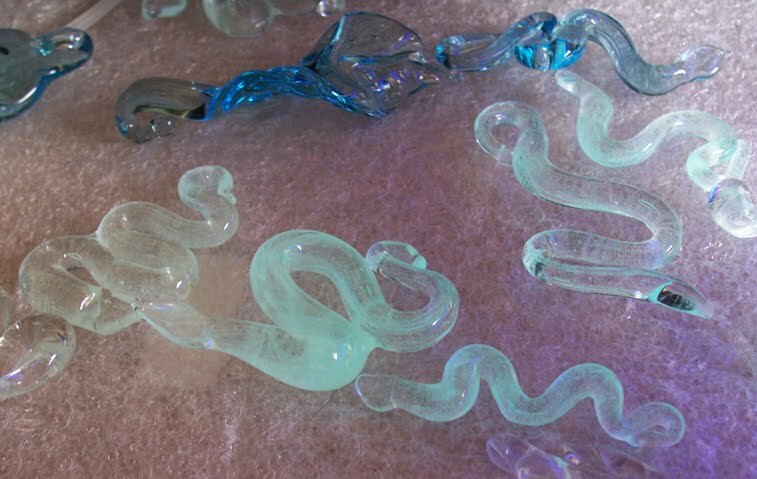 One of these new things I've been making are some glow-in-the-dark glass snakes. I got a batch of unknown glass rods a little while ago, and they don't seem to be compatible with any glass that I have. Rather than waste it I found that the glow-in-the-park pigment that I have (non-toxic non-radioactive I am pleased to say!) mixes very well into it. I ended up doing a separate kiln load just for these. Normally I would dot on some eyes with a different colour, but since they might crack and fall off I've used some bake on olive green glass paint. They glow really well, the pigment remains much stronger than when I tried mixing it into boro, and work especially well under UV blacklights too! Exposed to UV light, even with a little shade in daylight these little fellows really glow! At the same time I decided to make use of a Bombay Sapphire gin bottle that's been laying around the workshop for ages. (I didn't drink any of it either, the bottle came from a friend!) If you've not seen it, the bottle is made of a stunning pale blue glass. Almost all the lampworkers I know covet these bottles, and often make them into earrings and beads. However I didn't realise how tough the glass was! I wrapped the bottle in a plastic bag, and gave it a sharp tap with a hammer. Nothing happened expect a shrill perfect note that left my ears ringing! A finger in one ear, I tried again a little harder. Same result, and when the ringing in my ear had stopped I tired again. After a few attempts, tinnitus, and the worry I was going to damage my hearing I stopped and wondered about putting a call out on he Frit Happens glass forum to see how other people tackled this indestructible bottle! 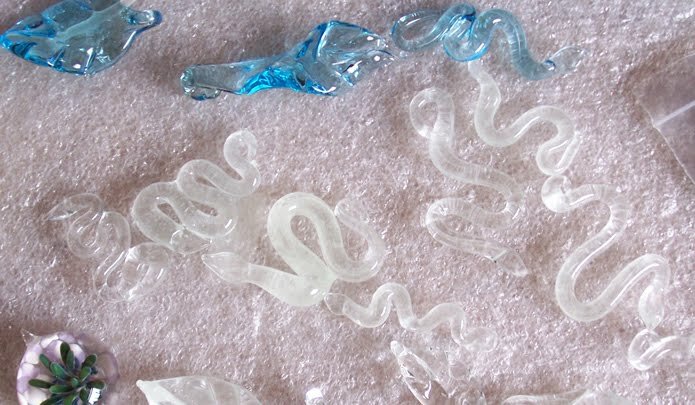 I then thought of glass cutters, and put a pair on the opening of the bottle, and within seconds had turned it into nice tidy shards of glass! It wasn't too bad to work, and made a few test leaves and a nice snake out of some of the shards, I'll certainly get around to melting down the rest of the bottle now. 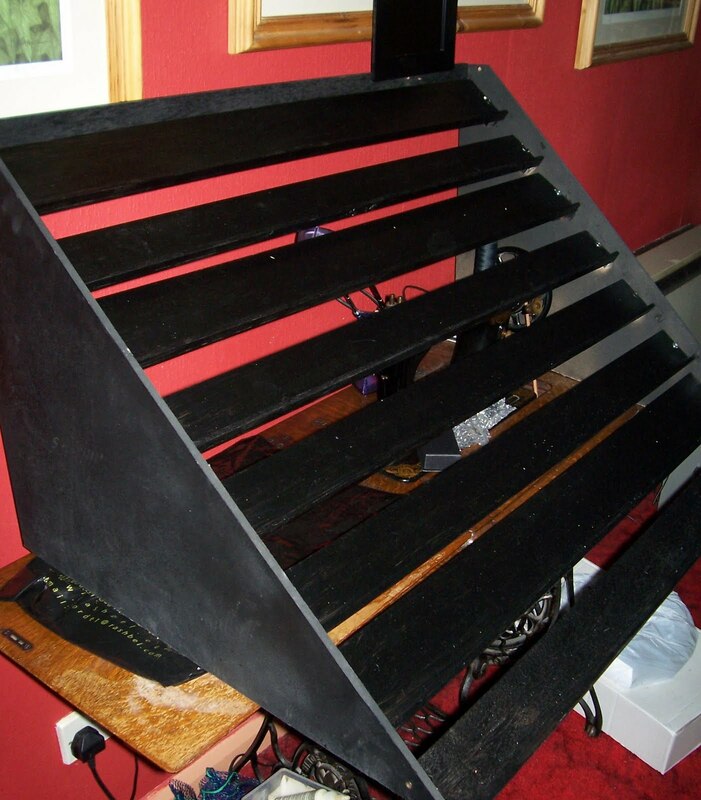 Ontop of all of this I've even been working on a new display stand. This one has solid shelves rather than the fiddly dowel ones that people had trouble putting boxes back onto, and also takes a lot more boxes. I'm still not 100% sure where I'll be, but I hope to be at large in London next weekend if all goes well. In the meantime I'll be filling and emptying the kiln as much as I can ready! This made me smile as my Hb and I do drink Bombay Sapphire and just put the empty in the recycling-not that is very often...makes me sound like I'm a drinker! The snakes are really fun, love them!